Talmadge Park Unit 1 showing 4394 N. Talmadge Drive Lot 53 at top and Wonder House of Stone. Photo taken by Erickson in 1930. San Diego Historical Society No. 89:17794-14. Master Builder Louise Mary Severin built this two-story Spanish Eclectic, Monterey style house at 4394 North Talmadge Drive in 1933, on Lot 53 located across the street from Talmadge Park’s landmark Wonder House of Stone in San Diego, California. 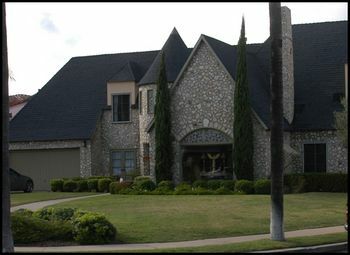 That mansion once housed the real estate offices and overnight facilities of the owners of the subdivision. A few houses further down, the former home of Roy Lichty, the subdivision’s promoter, sits as a reminder of people who worked to create Talmadge Park into an exclusive neighborhood. Much of this area is now generally considered to be the community of Kensington, although Talmadge Park was a separate development from that community, with its own unique history. 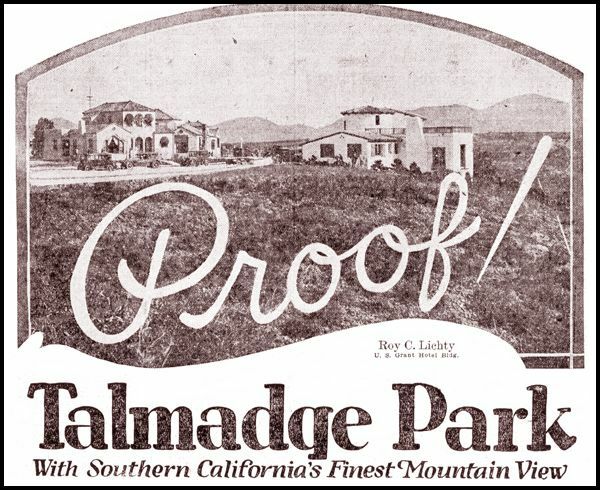 Local lore stated that Talmadge Park’s January 1926 opening ceremony took place at the end of Adams Avenue. 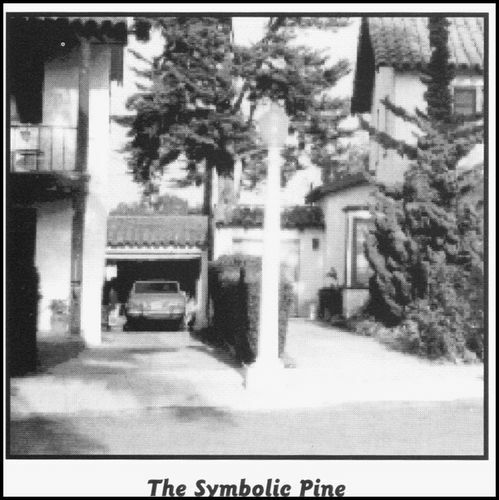 A photograph entitled “The Symbolic Pine” showed a picture of the houses at the end of Adams Avenue with a tree between their lots that author Dr. Thomas H. Baumann of the book Kensington-Talmadge 1910-1997 identified as the famous Monterey pine that had been ceremoniously planted by the Talmadge Sisters on January 3, 1926. Although the Talmadge Sister’s Monterey pine tree has long since been removed, its presence for many years marked the symbolic heart of Talmadge Park. It served as a tangible link to the subdivision’s opening day when an estimated 10,000 attendees stood the then empty lot to watch while the Talmadge sisters, Hollywood actor Buster Keaton, producer Louis B. Mayer and other Hollywood personalities kicked-off the opening celebrations. Photo courtesy William "Erik" DeCamp, Louise's nephew. 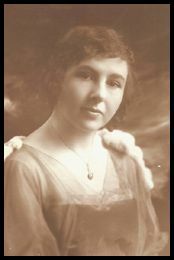 Undated Photo. Severin built the house during the early years of the Great Depression, a period when Talmadge Park’s cultural landscape, and the greater Kensington community in general, were evolving. Many of the developers, bankers, and silent partners behind the vision of the early subdivisions of the mid-1920’s were facing bankruptcy or were frantic to consolidate their resources after the devastating stock market crash in late 1929. Other builders, such as Louise Mary Severin, her husband Hilmer, and Louise’s mother Elizabeth Henkensmeier, leveraged family funds to buy and sell lots, build homes, and remain solvent during these difficult times. Photo courtesy Doug Cooper and Lorraine Iverson. While Severin had been building homes further west in Kensington Manor and Kensington Point in the late 1920s and early 1930s, this house study shows she moved her building focus to Talmadge Park in the 1930s. 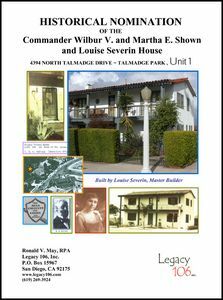 Notices of Completion and Water Permit records document that she was involved in nearly 10 percent of Talmadge Park’s 256 lots between 1931 and 1939, a contribution not known until this study. 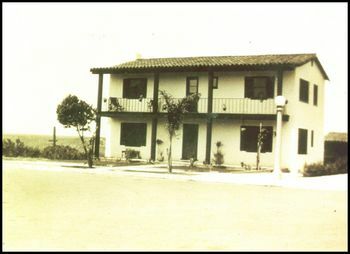 This early photograph of the house was probably taken in 1934, when Wilbur V. and Elsie Shown, U.S.N., owned the home. This may be Wilbur Shown, but his identity has not been confirmed. Note the original round columns which were changed to square columns within a few years after the house was built. 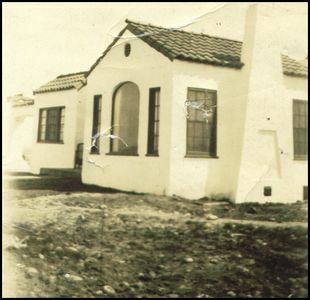 4394 N. Talmadge Drive in the mid 1930s. Photo courtesy Doug Cooper and Lorraine Iverson. Talmadge Park Unit 1 exhibits multiple layers of cultural landscape change that are linked to the community’s social and economic development. Legacy 106, Inc.’s research into the Talmadge Park neighborhood has led us to conclude that the community experienced three distinct waves of historic vernacular landscape settings in the historical period from 1925 through 1960. 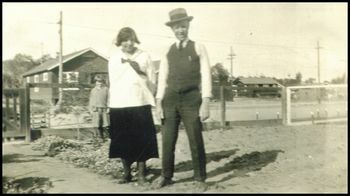 The first wave was the 1925 approval of the “Movie Girl” Subdivision and the January 1926 opening ceremonies. Exclusive and expensive with its palm tree-lined streets, ornamental street lights, completed sidewalks, and high value “improvements,” the first houses located within Talmadge Park Unit 1 formed a clear historic setting identifiable as the Talmadge Sisters’ subdivision. During the first wave of the Movie Girl Subdivision, Lot 53 was part of the open space staging area where the 1926 subdivision dedication ceremonies were held. This vacant lot was also the site of the famous Monterey Pine tree, ceremoniously planted by the Talmadge Sisters. This historic landscape lasted until the end of 1929 when the stock market crashed and economic disaster turned into the Great Depression. Both these historic events effectively ended the first wave of Talmadge Park’s historic landscape. Photo of another example of a house built in the area by Louise Severin. Photo courtesy William "Erik" Decamp. The panic of the Great Depression caused many of the players of the First Wave Historic Landscape to abandon the Movie Girl Subdivision and sell-off their assets. Gone were the dreams and control over the subdivision. 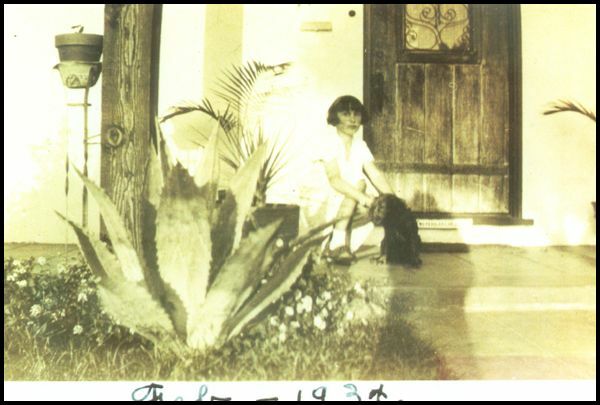 When Louise Severin and her family scouted vacant lots for building their style of Spanish Eclectic houses, they were not bound by any constraints that might have been imposed by the founders of Talmadge Park. The second wave of housing development along Talmadge Drive spanned 1929 through roughly 1936. Long after the Movie Girl Subdivision and Great Depression were legend in the Talmadge neighborhood and World War II ended in 1945, returning American soldiers and their families bought up vacant lots and ready built houses with hopes for a bright and peaceful future. The late 1940s were the Atomic Age and Post War Modernism marked the third and final wave historic landscape in Talmadge. 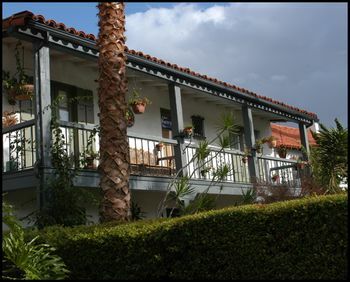 Densely packed neighborhoods with palm tree-lined streets, rows of older Spanish and Storybook style, and new Ranch and Minimal Traditional style houses marked a wild and zany time where families held cocktail parties, Polynesian luaus, and church bake sales. The new post war economy ushered in prosperity and hope for the future. The meaning of the first and second wave historic landscapes was long forgotten. When is an Empty Lot Not Just a Lot that is Empty? The new evidence suggests a theory that the developers of the first wave of development of the 1920s may have included hidden investors who deliberately left critical lots vacant to maintain view sheds for the exclusive estate type development. 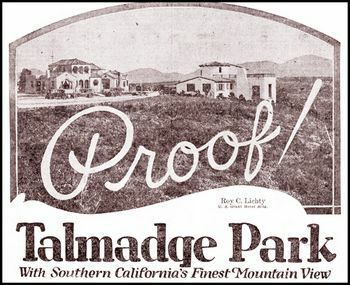 The most visible players involved in the Talmadge Park subdivision included Roy Lichty, general manager of Talmadge, his brother and co-owner of Talmadge Park Guy Carleton Lichty, Los Angeles capitalist I.C. Freud, president of Southern California Realty, George Burnham, vice president of Southern Trust and Commerce Bank, San Diego Mayor John L. Bacon, and society woman Mrs. Francis Mead. These investors put a private investment of $75,000,000 behind the project. The curious part about the chain of title for Lot 53 lies in the question, why did this lot remain empty and undeveloped until 1933, when the subdivision formed in 1925? Was it just because nobody picked this lot to buy and develop, when so many other choice empty lots were available? Perhaps as an empty lot it served a better use to preserve the Wonder House of Stones’ view corridor to the distant mountains, an advertising angle Roy Lichty used to great advantage to promote the subdivision’s investment value to prospective buyers. If the theory were true, it would imply that the owners of the lot had good reason not to build on the lot, implying a relationship between the owners of Lot 53 and the interests of the owners of the subdivision. While this may at first glance seem a bit far-fetched, investigation into the chain of title of Lot 53 suggests interesting evidence that it may have indeed been true. If so, then the first wave’s landscape functioned differently than the second wave historic landscape of the Great Depression years. 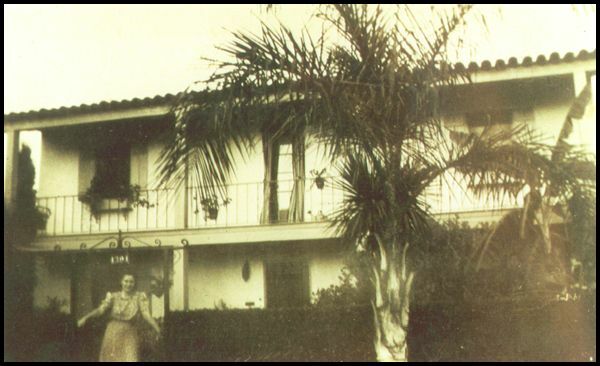 The historical events of the Great Depression shattered the subdividers’ dream and Louise Severin unknowingly built over the former view sheds with her Spanish Eclectic house. Thus, her development would have marked the threshold for the second wave of the cultural landscape of the 1930s. The owner of the empty lot was Magdalena Bowman, first wife of Wirt Bowman, hugely wealthy capitalist and a co-owner of the famous Agua Caliente resort in Tijuana, Mexico. Lot 53 was one of three lots the Bowmans owned in Talmadge Park. 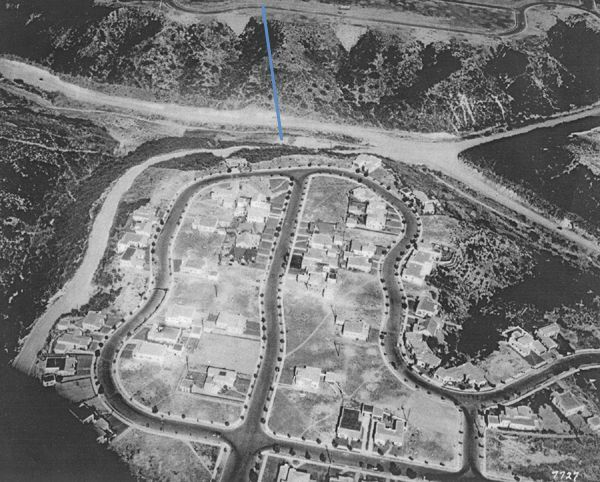 The other two lots, 62 and 63, located side by side only a few houses away, were also canyon rim lots. In 1933, the two lots next door, 60 and 61, would be the home of subdivision owner Roy Lichty. Lot 63 would become a National Register Landmark, a house built by Cliff May, son-in-law of Roy Lichty, who married Lichty’s daughter Jean. The deeds make it clear that ownership of Lot 53 was held by the Bowman’s along with two other lots, 62 and 63. The Bowmans, incredibly wealthy and influential San Diegans, with residences elsewhere in the city, were financially capable of building on the lots should they have wanted to. More importantly, they were financially capable of not building on the lots, should they have wanted to. And that is exactly what they did from 1927 until 1932. The status of the lots did not change until 1932, during the hard times of the Great Depression. 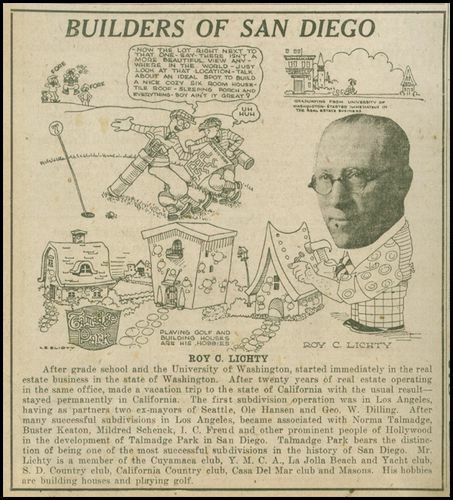 The deeds show that in 1932 the Bowmans shifted their personal San Diego real estate holdings en masse over to a corporate entity, the Wirt G. Bowman Investment Company, Inc. on April 11, 1932. 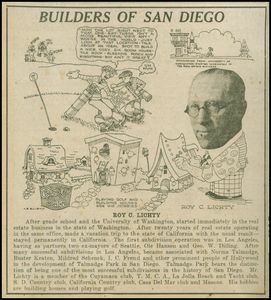 Articles of Incorporation show that it was a newly formed entity, with papers filed with the State of Arizona on April 6, 1932 (San Diego Historical Society #150488). In August, the Bowmans then sold their three Talmadge Park lots, along with other holdings, to Edward S. Bernard, who was the manager of the U.S. Grant Hotel. "Financier Whose Life Along Border Became Saga of West Passes at Tucson. One of the big three who built and operated the fabulous Agua Caliente resort below Tijuana, died yesterday in Tucson, Ariz. He was Wirt G. Bowman, 75, friend of notables, a political power for many years in Mexico, through the connections with revolutionary leaders, and a man who reportedly often handled millions of dollars in gold like some men push poker chips. Mr. 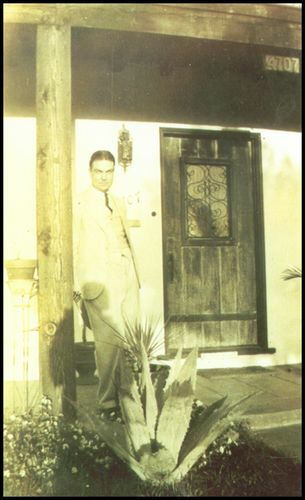 Bowman owned and operated the old Foreign Club in Tijuana, at one time a big gambling club, and later joined with Baron Long and James N. Crofton in spending $5,000,000 in building the Agua Caliente resort proper. Later, they built the race track, with its $100,000 Agua Caliente handicap, added a golf course and posted the then world’s richest golf purse, $25,000. MONEY FLOWED IN. Money came in torrents from Americans, mostly from Hollywood. The golden flood lasted from 1928 until 1935, when all gambling was abolished in Mexico on order of then President Cardenas. Another investor in the resort was Gen. Aberlardo Rodriguez, a former president of Mexico and later governor of Sonora. Mr. 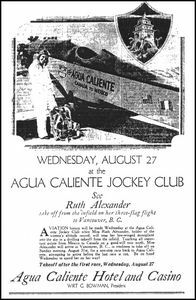 Bowman and Rodriguez withdrew from the Agua Caliente setup a few years before it was closed. Mr. Bowman’s first wife died in the 1930s when they resided in Palm City."